There’s no substitute for a paper manuscript! 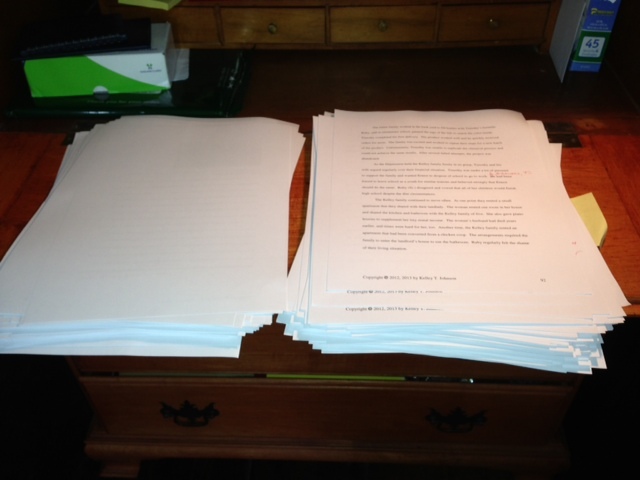 I’m not proud of it, but I’ve gone to the copy shop twice this week to get a paper version of my manuscript printed. At 400 pages and $0.10/page, it cost $40 to print once – yikes! Why can’t I just learn to edit on the computer? It just seems easier on paper. I can proof read easily, red-line the mistakes, and write notes to myself in the margins. Sure, I can do that with track changes in MS Word, but it doesn’t feel the same. Track changes always feels messy after a few iterations, and the writer has to make sure that edits “accepted” don’t create a formatting issue, particularly with spacing. While the above picture is just loose leaf pages, I wholeheartedly recommend spending the few extra bucks at the copy shop to get a spiral binding and cover on your manuscript. Any copy shop can do it, and then you’ll have a bound version of your paper that you can stash as a record of your revisions. I had done this regularly until Staples screwed up my last order. I also use a software-type convention for recording the version of my manuscript. I use 1-2-3- for major revisions, and small letters, a, b, c, for minor revisions. Thus, my manuscript was developed 1a, 1b, 1c, 2a, 2b…. In my case, I usually had a few minor revisions for every major revision. What constitutes major and minor? Major changes could have been writing, editing, adding references, or adding supplemental material such as illustrations/pictures. Minor changes were almost grammatical corrections, the rewording of awkward sentences, or factual changes (such as dates). There’s no right or wrong way to develop your manuscript. This was just my approach that I wanted to share. I am a fan of editing hard copy as opposed to on the computer screen. I think it’s more thorough and easier to read and you’re less likely to skip errors.